We had a very simple soup the other day called kongnamul guk (beansprout soup) and it couldn't have tasted better with its mild and refreshing broth. We are accustomed to eating spicy jjigaes (soup/stew) that Korean food is known for, so it was a nice change of pace to get something light and clean. The broth is made from boiling myeolchi (dried anchovies), kelp, and garlic cloves, providing an aromatic fishy smell that reminds me of the coastal fishing towns that I used to frequent in Korean. If you don't have access to these ingredients, substituting them with minced garlic, salt, and gochugaru (red pepper flakes) will be just as good. And for those suffering from the occasional hangover, this soup is just for you. 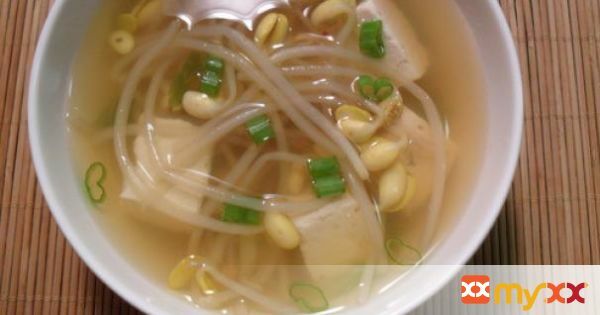 Koreans enjoy this "hangover" soup as a pick-me-up after a hard nights drinking (see also bugeo guk, dried pollack soup) but it can be regularly found alongside the main dish and banchan side dishes in most Korean homes. Though we do not serve soup on a regular basis in our homes, if I can convince the missus to clean the sprouts prior to cooking then this will be a regular at our table. 1. 1. Submerge the soybean sprouts in a large bowl with water; floating skins and other small debris should be discarded. Though optional, remove dirty end tips by hand until desired amount is reached. Some cook the beansprouts without removing tips, but follow the common adage: if it looks dirty, it usually is dirty. 2. 2. In a pot, bring 8 cups of water with the dried anchovies, garlic, and green onions to a boil, uncovered. Boil for about 10 minutes; remove broth ingredients from the broth. 3. 3. Add the beansprouts and gochugaru (red pepper flakes) and boil, covered, for about 5 minutes over medium high heat. Keep lid covered during the entire duration of cooking. Add tofu cubed pieces and boil for another minute. 4. 4. Sample the broth and adjust with salt and pepper. Garnish with scallion slices and serve hot. 5. *Be careful when purchasing these soybean sprouts (kongnamul), as they are often confused with mung bean sprouts (sukju). The soybean sprouts have larger heads compared to their smaller counterparts, which are much smaller and sometimes do not have heads on them. They are available at most Korean grocery stores or your local Asian market.